Compensation was provided by Schick® Quattro for Women® TrimStyle® via Glam Media. The opinions expressed herein are mine and are not indicative of the opinions or positions of Schick® Quattro for Women® TrimStyle®. July is now in full swing and you know what that means....the temperatures are skyrocketing. Our scarves, sweaters and coats have been stored away for a few months now and cooler clothing, like shorts, are a must to beat the heat. I rounded up a few of my recent looks wearing some of my favorite shorts that are keeping me cool in 100+ degree weather. Yes, that's the kind of temps we have been experiencing in Texas. With shorts being on constant rotation, smooth shaven legs are a requirement for us ladies. I haven't been brave enough to take the laser hair removal plunge, nor have I wanted to spend the money that goes along with it. Plus, a handful of my girlfriends that did the whole laser thing said it didn't even work....a hefty price for pain and money down the drain. Even though it can be a hassle, I have chosen to still do things the old fashion way with a quality razor like the Schick® Quattro for Women® TrimStyle® and a can of shaving cream. I have tried out numerous razors, but this one takes the cake because it's a 2 in 1. One end is for legs and the other is a trimmer for your bikini area. Genius, if you ask me. It comes with a battery and a convenient holder to hang in your bath or shower. Because it has four blades, my legs get extra love and attention. I can even skip a couple days of shaving. Finding a razor that can conquer two jobs is a double bonus in my book and a summer essential that we sometimes overlook. I am here to put a little bug in your ear. Next time you are out and about, take a stroll down the razor aisle and keep you eyes peeled for the Schick® Quattro for Women® TrimStyle®. You will sure to be both shorts and bikini ready. 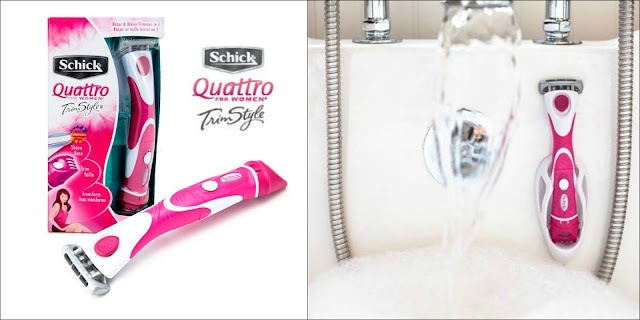 Schick® Quattro for Women® TrimStyle® enables women to shave, trim and transform themselves with a simple flip of the handle. Achieve a shave so smooth you can skip a day or two with this must-have accessory that gives women the confidence and energy to feel free in their skin. https://www.facebook.com/SchickQuattroforWomen. Love this, the shorts and boots is my FAV! I know! It's all I can do to not melt here. This heat is insane! you look great in your shorts. let's trade. I'll give you endless rain for your overbearing heat! p.s. your summer outfits are just perfect! I hate when I have to shave my legs daily! I'll give the Schick Quattro a go! Cute outfits, especially the first one! A friend of mine did the lazer thing... took a year and no sun! Gotta have my tan! This humidity does not help either! I wish I could somehow magically make it so I never have to shave... without the pain or any money spent. One day maybe. In the meantime, this looks like a great razor. ALL GOOD! But my fav has to be the first look. SO chic! Every day I change out of my work clothes and into shorts! I love all of the white that's filling your outfits these days! Such a great summer staple. I love all of your outfits but I think the first one is my fav. I've loved all of these looks but the last is my FAV. I'm always on the hunt for a new razor. I'll check this one out. I love the Schick Quattro razors! I need a new razor! The boy uses Schick so maybe I need to get on his level! Can't decide which outfit I love most!! Thanks for the razor review:-) Hope you are having a wonderful day! I am obsessed with your heels in pic #1 ma'am...LOVE them! I hate shaving my legs, but when I do I have to have the best razor! I'll check this one out. I love all of these outfits! so classy and cute!! you inspire me in so many ways! !